After a break of three weeks, I’m ready to start posting on the site again. I’ve been busy designing the third part to the Qur’anic Arabic books for Al Barakah school. As we near the end of our second term, motivation is something that begins to wane as the students (and sometimes teachers) get into holiday mode. 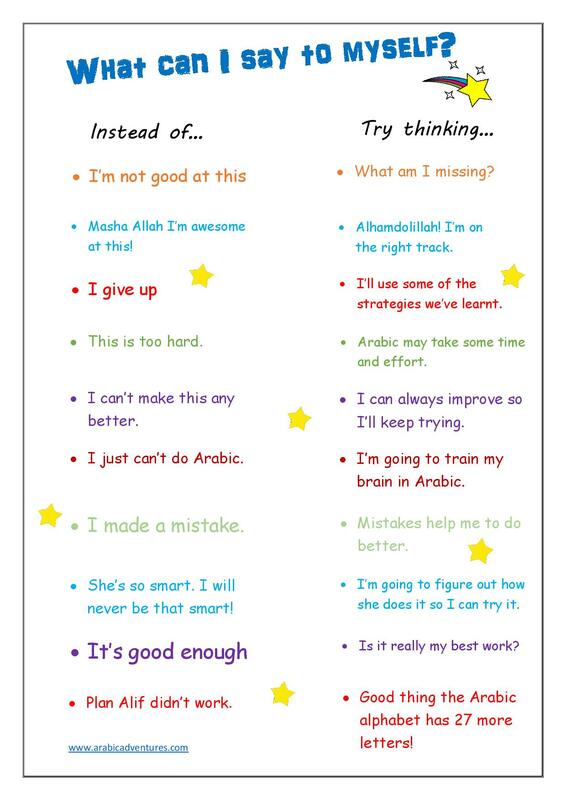 I came across a lovely motivational reminder for students that someone had created for their maths class, so I thought why not create one along similar lines for my Arabic students. Once I hand it out, I will of course talk through each point and discuss with the girls. The point referring to “techniques” refers to for example our lesson spent on figuring out their preferred and more useful learning techniques to memorise Arabic vocabulary. Each student discovered whether they were visual, auditory or a kinaesthetic learner. So this point will encourage them to keep using the techniques that they have discovered works best for them. Please feel free to download and share for yourself, children and classes. Jzk. This entry was posted in Behaviour, General and tagged arabic, arabic grammar, arabic grammar review, Arabic Language, Arabic lessons, arabic printables, arabic worksheet, language, language learning, motivation, Qur'anic Arabic, Quran curriculum, quran syllabus, reminder. Bookmark the permalink. Amazing!!! I like how you implement the positivity in their mind.